According to the Barclays Center Official Statement, prepared by Goldman Sachs for the tax-exempt bond deal, a document called the Transit Improvement Agreement--yet unseen--lays it out. In addition, as part of the Transit Improvements, RailCo is obligated to reinforce and repair at its own cost and in accordance with standards and procedures set forth in the Transit Improvement Agreement any subway tunnel structural support members that are found to exhibit a twenty-five percent (25%) or greater section loss and that are in the load path of the Transit Improvements. 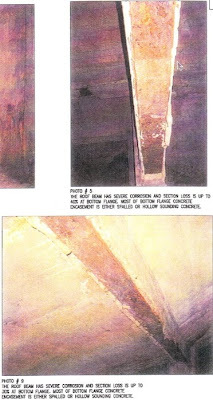 The Arena Developer has performed some preliminary testing on the support members within the subway tunnels to determine their structural integrity, and such testing indicated that some columns had deterioration in excess of twenty-five percent (25%); however, neither the final quantity of columns with more than twenty-five percent (25%) deterioration nor the level of deterioration of untested columns is known. Funds for such tunnel support repair work will be provided for out of contingency funds in the budget for the Arena Project. The total cost of the Transit Improvements, which estimate is based on bids on so-called "ninety percent" (90%) construction documents, is anticipated to be approximately $71.6 million, $3.2 million of which has been contributed and $68.4 million of which is remaining. Note that the total cost of the Transit Improvements, $71.6 million, covers items other than the damaged tunnels, including a new subway station entrance. How much is available in contingency funds in the budget for the Arena Project? The total is $53.1 million, including $19.7 million in Hunt Contingency (the construction company), $25.3 million in Owner's Contingency, and $8.1 million in Infrastructure Contingency. The latter seems a rather small sum for tunnel repairs.